12.5" RCOS @ ~f/9 (2880 mm fl) 0.64 arcsec / pixel. The Zoomify image scale is 0.85 to 2.84 arcsec / pixel. 1/9/2013 to 3/17/2013 Chino Valley, AZ... with CCDAutoPilot5 & CCDSoft. AOL guided. eXcalibrator v4.0 for (u-g), (g-r) color balancing, using 54 stars from the SDSS-DR9 database. CCDBand-Aid to repair STL-11000M vertical bars. 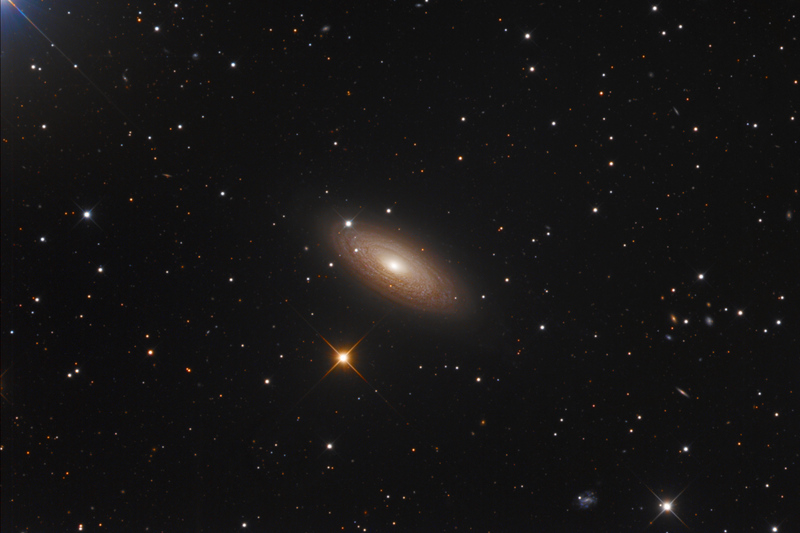 NGC 2841 is a tightly wound unbarred spiral galaxy in the constellation Ursa Major. A 2001 Hubble Space Telescope survey, of the galaxy's Cepheid variables, shows that NGC 2841 is about 46 million light-years from Earth. With a diameter of over 150,000 light–years, the galaxy is larger than the Milky Way.